So you want to show your cat? Or you’re just interested in finding out how it all works? Hopefully in this article I’ll be answer a lot of your questions! 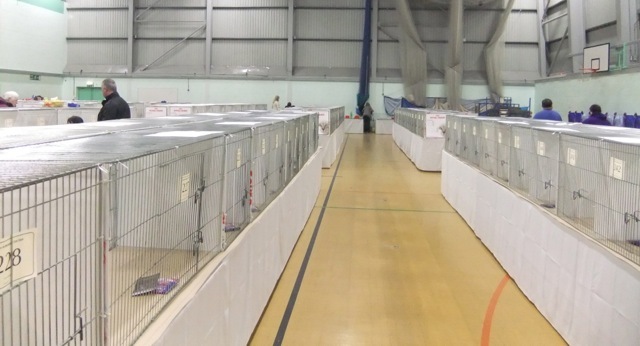 There are a few different organisations that run cat shows in the UK – the main two being the Governing Council of the Cat Fancy (GCCF) and The International Cat Association (TICA). 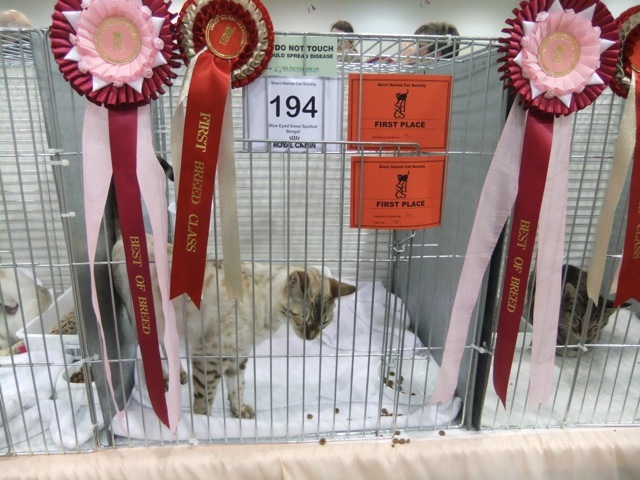 The GCCF runs many more Championship shows than TICA (including the Supreme Cat Show), so we’ll talk about them in this guide. Are cat shows just for pedigrees? Our Annie cat has done extremely well as a Pedigree Pet, as a good temperament is one of the main attributes HPs are judged on, alongside their looks but in this article I’m going to mainly focus on pedigree cats in the main breed classes rather than HPs. The very first thing you need to do before showing your cat is to make sure you buy the right kitten/cat in the first place! You need to make sure you do your research very thoroughly and buy from a reputable breeder who registers their cats with the GCCF and who will give you lots of help and information about showing. 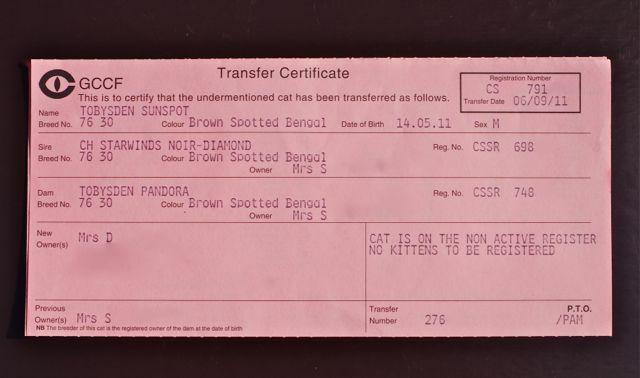 When you buy your kitten/cat, the breeder needs to register the cat in your name and you’ll get a registration slip (these are no longer pink though) from the GCCF showing the full pedigree name of the cat and lots of other information. It’s important that you keep this slip in a safe place, not only because it shows you’re the registered owner, but also because these details need to be written on cat show entry forms. If you want to show your kitten, they must be at least 14 weeks old on the day of the show to be eligible, and they’ll be classed as a kitten right up to 9 months old. After that, cats are shown in either Neuter or Adult classes, depending on whether or not they’ve had the operation. Kittens can win rosettes and other prizes but, unlike Adults and Neuters, their wins don’t count towards any titles. It’s good to show them young, though, as they can get used to being judged and handled at a show from a young age; and also you as the owner will get feedback from the judges as to what sort of potential your fur-baby may have. If your cat or kitten really doesn’t enjoy going to shows, and you’ve tried them at two or three (the first will always be daunting as it’s a new experience for them), you really should consider whether it’s in their best interests to show them or not. An unhappy cat does not make a good show cat. You want to give it a go – so how do you find out about shows? Some shows are breed-specific, e.g. the Bengal Cat Club show. Therefore, only Bengal cats can be entered into the show along with household pets of course. 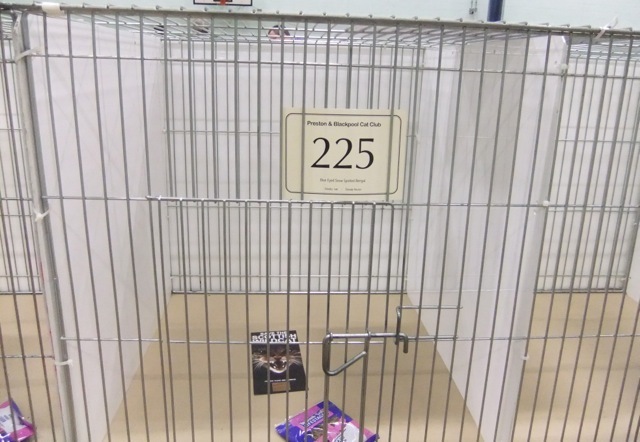 Generally, these have the fewest amount of cats entered. Medium-sized shows are where there may be a number of breeds exhibited, but only of a certain type – e.g. the Short-Haired Cat Society show. As the name suggest, only short-haired cats can be shown (or any HPs), but this will cover quite a few different breeds. All GCCF cat shows take place on a single day, usually a Saturday, though sometimes on a Sunday. You are not allowed to show your cat on consecutive weekends, there must always be at least 13 days between the shows you enter your cat into. 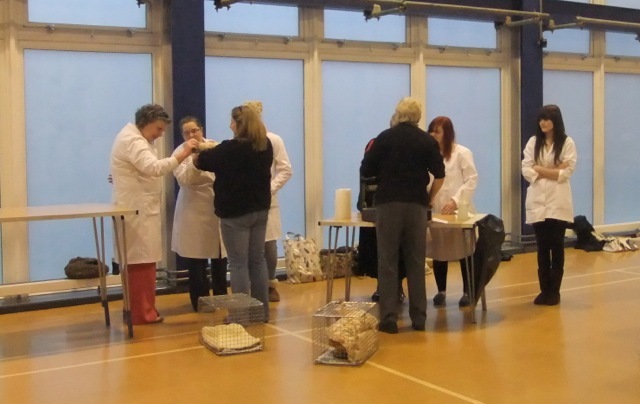 Shows take place in public places such as leisure centres or exhibition centres. The general public have access to the show in the afternoon (for a small fee!). This is a very important document. It lists all the classes at the show split by breed cat-egory as shown above and also by Adult, Neuter, Kitten. Your cat is entered into their respective breed class (e.g. for me it would be FOREIGN NEUTER, BROWN SPOTTED BENGAL MALE) and also 2 – 3 side/miscellaneous classes which may be something such as Visitor’s Neuter or Junior Neuter. The schedule also lists which judge is assessing each class – this is important when it comes to earning titles, which I’ll talk about later. Finally, the schedule also has the all-important entry form and information regarding entry fees and closing dates. When you’ve completed your entry form, you send it off to the address shown making sure that you include a stamped, self-addressed return envelope so that you can get confirmation that your entry has been received and accepted. Great! I’ve entered my cat… So what happens now? It’s quite straightforward to show your cat, but you do need some important supplies beforehand! The show bag: this contains all the items listed above plus food, water, comb, cleaning wipes, our vaccination certificates, baby wipes, cotton wool pads, duster, camera, and pen. The need for all of these will become clear as we progress! Us cats: Although our coats are beautiful, they’re relatively easy to look after as we’re short-haired. So the day before the show, we just need a good groom with the comb. If you have a long haired cat such as a Persian, I’d imagine there are many more hours worth of coat preparation! Our mummy also cleans our ears with baby wipes and our eyes and nose with moist cotton wool pads (and then they’re put in the bag in case we need extra cleaning on show day!). So we’re all set! The next thing to do is to make sure the alarm’s set in time to wake us all up in time for our adventure! The big day has arrived – Showtime! So the big day is here, you’ve packed up the car with the show bag and puss cat in a suitable carrier (it’s easier at the show if you have a top-opening carrier, but this isn’t compulsory), you’ve programmed the address into your sat nav – so off you go! On arrival at the show, the first thing you’ll do is queue up to get your entrance paperwork (generally the earlier you get there, the less time you spend queuing – the schedule lets you know about opening times). All you need to do is state your name and you’ll get a piece of paper that has your cat’s details on, along with their show pen number. You must check this to make sure all the information is correct and that there are no spelling mistakes. Before you rush off to your show pen, though, there is one very important thing that every exhibitor must do! All cats are “vetted in” – i.e. qualified vets will be at the show to check every single cat before they go into the show hall. This includes checking for any signs of illness, or for infestations such as fleas/ticks. Your cat’s vaccination certificates will also be checked. If there is any sign of anything wrong, which includes the vaccinations being out of date, the cat will not be accepted into the show and you will not get a refund. The cat is then either placed into isolation (if such facilities are available) or sent home (with you taking them of course!). But of course, your cat will pass the vetting-in procedure with flying colours – most, though not all, cats do :). The vet will sign your entry paperwork that you picked up earlier and you can go into the show hall and find your show pen! When you’ve found your cat’s pen, it’ll be empty, except perhaps for a leaflet or a sample of cat food for puss to try. The first thing my mummy does is clean all the bars and the sides with wipes as the pens can get very dirty when they’re stored and she doesn’t want us to get any illness when we rub against the sides. The next job is to put all the bits and bobs we discussed earlier into the pen – the sanitary tray with litter, the blankets, water in the water bowl (which clips onto the bars) and some food. 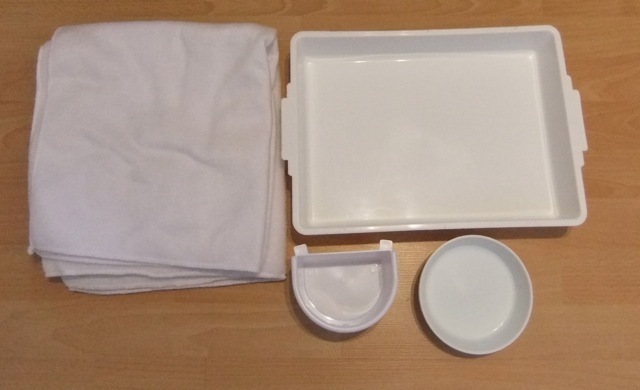 All of these things stay in the pen for the whole day with the exception of the food bowl which must be taken out before morning judging commences (usually 10am – more on that soon). Judging usually starts at 10am and the first classes to be judged are the breed classes – this is where Adult and Neutered cats can earn titles, so it’s important the judges are impartial. Therefore, all owners are required to leave the show hall for the entire morning and are not allowed back in until usually around 12:30-13:00 (depending on the show). There are usually several judges assessing the different cat-egories who often have a Judge Steward accompanying them. They visit each cat individually, the Steward carefully takes the cat out of their pen and they have a small, portable table that the cat stands on. The judge looks at all the different points relevant to that breed which may include shape of head, markings, etc. After they’ve looked at all the cats in the class, they’ll award 1st to 4th places. For breed classes, they’re split into Male and Female, and then the judge chooses who is Best of Breed (BoB) out of the 1st placed male and the 1st placed female. They’ll also decide on which certificates to award at this stage such as Premier Certificates, but we’ll talk more about that when we look at how cats earn titles. Judging carries on for most of the day, but by the time the owners (and the general public) are allowed into the show hall, most of the breed classes will be complete and the judging will have moved on to the side classes, although this is done in the same way as for the breed classes. 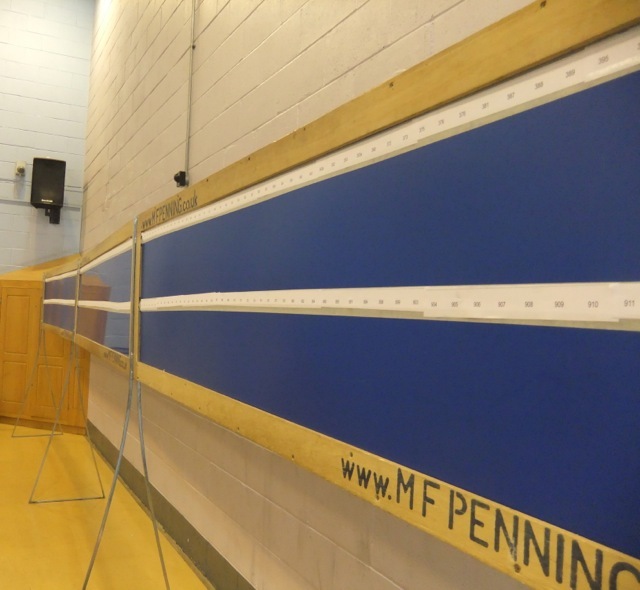 Each class is shown individually – these boards can get very crowded once the results start coming through as all the eager owners want to see how their babies have done! Look at all my rosettes! Then – huge excitement – as one of the judges looks at all Best of Variety winners and decides the overall Best in Show! 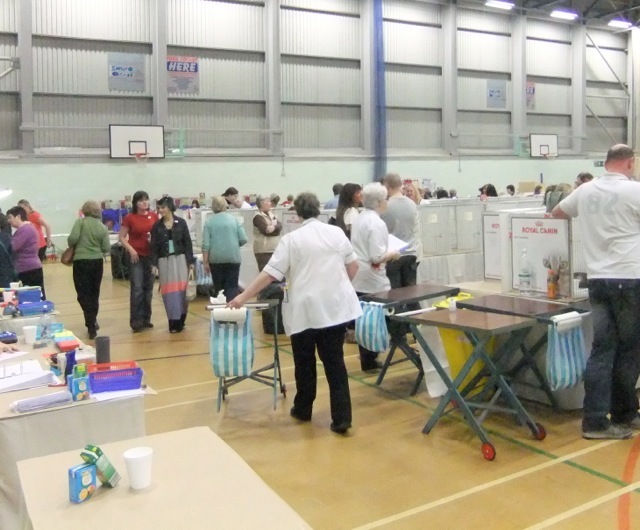 🙂 This is usually the last judging of the day, and not long after this, all exhibitors are allowed to pack up and make the journey home (though you are not allowed to do this until the show manager officially announces that the show is closed). So hopefully a happy day is had by all and there’ll be lots of fuss and attention given to the cats, no matter if they won or not 🙂 The only thing to do then is wait for the judge’s report to be published on the GCCF website, so you can see what they thought of your cat! 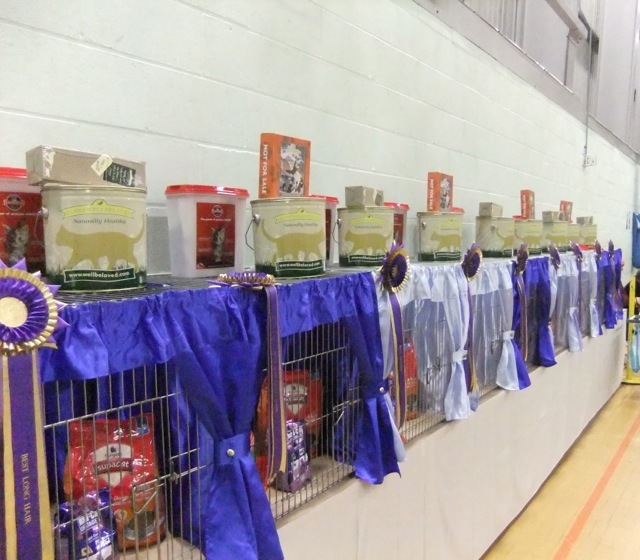 This is the most prestigious of all the GCCF cat shows (the feline equivalent of Crufts). It works slightly differently to what I’ve previously described in that there are no side classes, the judging takes place in a ring away from the pens, therefore the pens are decorated and the owners don’t have to leave the hall, and the show is open to the general public from earlier in the morning. As stated earlier, all Adult and Neuter cats can earn titles, so here’s a quick guide to how it works. The winner of the Adult breed class may be awarded a Challenge Certificate if they are deemed to be of good enough quality. The cat needs to earn three of these from three different judges, and then they’ll be a Champion Cat (Ch). The same goes for Neuters, except they earn Premier Certificates to be able to earn the title of Premier Cat (Pr). Once they are Chs or Prs, the cats then can be awarded Grand Champion or Grand Premier status, though this is harder as they are not awarded by breed, but rather by section so much more competition. 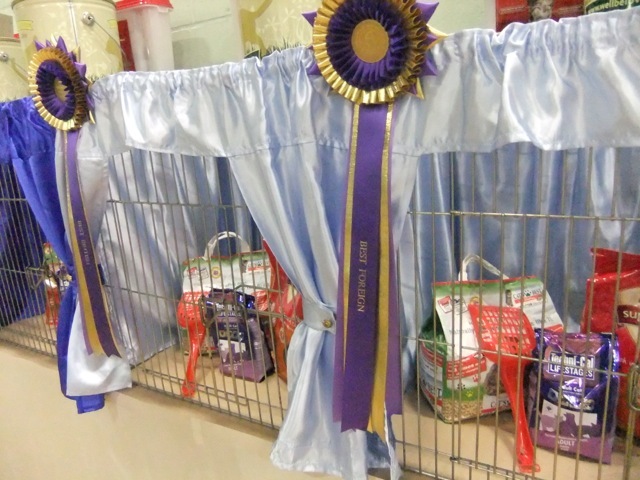 Again, three certificates from three different judges mean that the cat can be called a Grand Champion or Grand Premier. Grand Champions and Grand Premiers then compete for the title of Imperial Grand Champion/Premier. There is just one class for each cat-egory per section, and to obtain the title a cat has to gain Imperial Certificates from five different judges! The next level is then Olympian – Bronze, Silver and Gold. Again the cat needs five certificates from five different judges to get Bronze, then five for Silver & five for gold. At least four of these five must have come from all-breed shows. Thanks for your feedback, Zoe! Hey there! Would you mind if I share your blog with my zynga group? There’s a lot of folks that I think would really appreciate your content. Please let me know. Thanks. Hi, this is a great piece. Could I copy it for inclusion in the Progressive Ragdoll Breed Cat Club’s annual, Rags Progress. PS we also have a Bengal cat….hes a right character ! Thanks so much. I’ve changed the references to Bengal to read Ragdoll, and added a few more photos, but there is a credit to this blog and mentions that the article is based on your one in the Bengal World website.